After getting into a heated argument with former BFF Kandi Burruss at the Real Housewives of Atlanta reunion, Phaedra Parks is adamant that she’s moving on. Phaedra also promises she no longer has issues with Kenya Moore, or the oatmeal cream pie she’s trying to tempt us with! “I apologized to Kenya because she expressed that I had hurt her feelings, which was not my intention, so I felt owed her an apology,” adds Phaedra. Wait – it was not Phaedra’s intention to hurt Kenya by comparing her skin to a Little Debbie snack? Mmmmkay. Although Phaedra is eager to escape her tanglings with Krayonce, she applauds Kim Fields for asserting herself against Kenya’s comments. “I was thoroughly delighted to see Kim take a firm, defensive stance,” Phaedra praises in her Bravo blog. 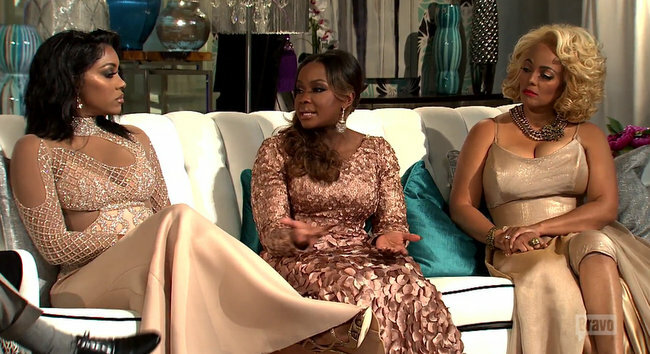 TELL US – DO YOU BELIEVE PHAEDRA HAS MOVED ON FROM HER ISSUES WITH KANDI AND KENYA?